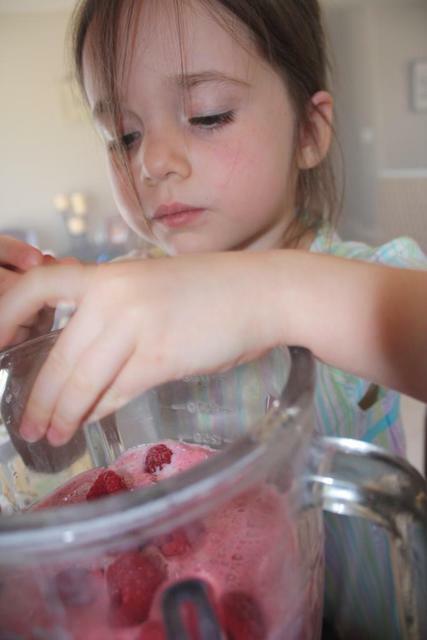 For a treat tonight we made berry-licious smoothies with the girls. While making them I told them a “story” (they listen better to what I have to say when it starts with “once upon a time” and includes a few princess references) to go along with what we were doing. I told them how what we were making was really food for our bodies and would give us tons of energy. I also let them know the berries came from the local farmers market last year (I bought and froze TONS of berries) and why it is so important to buy from local farmers. I believe it is a powerful learning experience for my children and helps them understand WHERE their food comes from helps them appreciate it that much more. It strengthens the local community, supports the prosperity of the local farmers and gives my area a little character. Keeps the dollars I spend within my community. If my girls were a bit older I would host a bake-off. We would each whip up our favorite recipe and receive extra points for using local or organic ingredients ingredients or making it extra healthy. These are some recipes I LOVE; they would be perfect for your Healthy & Eco-friendly Bake-Off! !